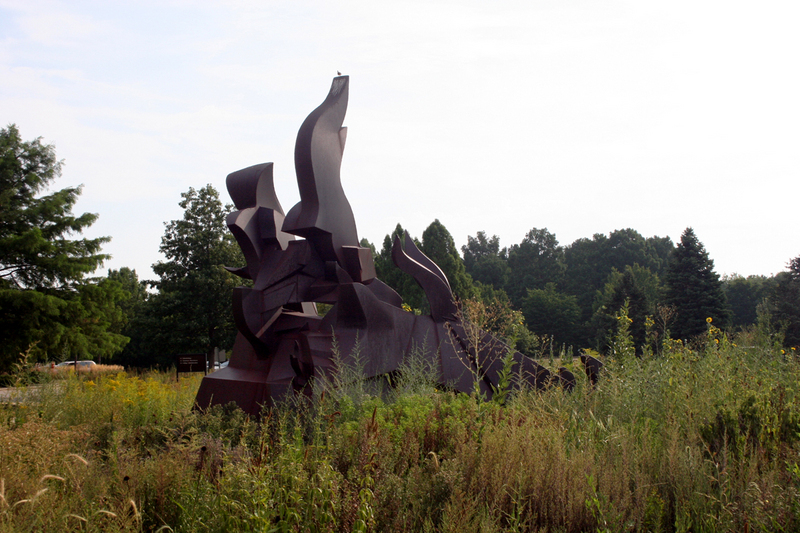 Artist Richard Hunt (1935- ) created these welded cor-ten steel sculptures, which measure approximately 23' long. The Illinois "Percent for Art" program acquired the pieces of art. They are located at the Veterinary Medicine Basic Sciences Building. 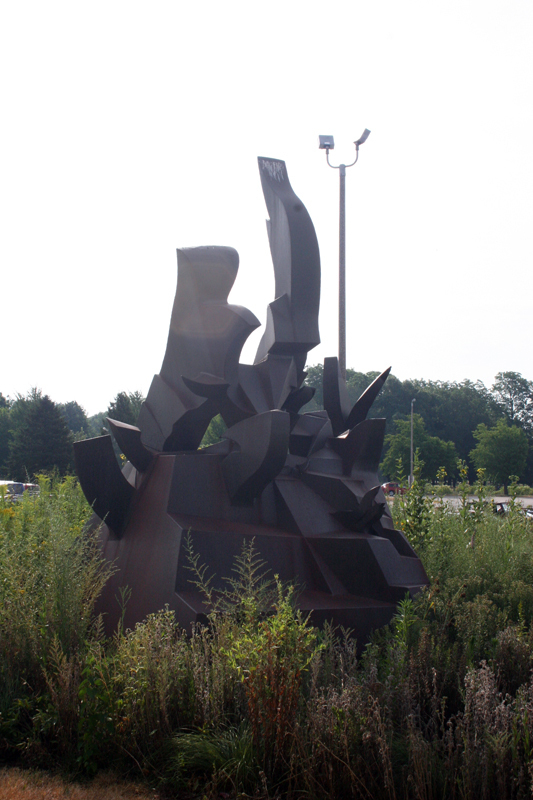 Richard Hunt's massive steel sculpture stands before the Veterinary Medicine Building as a big dark abstract form that seems strangely and vaguely recognizable. A combination of natural, flamelike outcrops and sharp-edged chunky planes, the work reaches a height of fifteen feet. "The whole construction is like a large animal growing, developing from the earth," the artist explained. 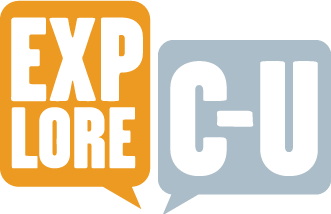 "The imagery is generalized from a variety of sources. Conceptually it draws its spirit from a dynamic of growth and movement. It is evocative of animal forms, not a particular animal." Workers in the building evidently do not see it in quite this way. Recently a photographer took aim and a lab technician passing by yelled excitedly, "No! No! Shoot it from here! Then you can see it's a dog!" 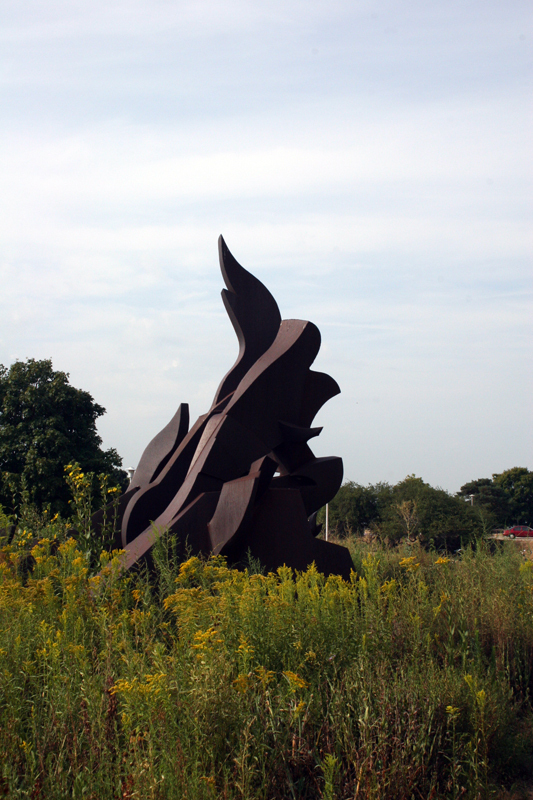 The sculpture, made specifically for the site, is one of a series the sculptor calls "hybrids": organic, imaginative creations such as his Wily (1975) at the University of Chicago, a tall bronze alive with curving protrusions, and the 1977 welded bronze Cartwrigllt Mound playground piece in an Evanston park, a spiky, sharp-finned artwork suggesting a prehistoric animal. Chicago born and internationally known, Hunt lives and works in his native city. His striking welded bronze Slabs of tile Sunburnt West is located at the university's Chicago campus. Other works include those in the Metropolitan Museum of Art and the Museum of Modem Art, New York City; Howard University and the Hirshhom Museum, Washington, D.C.; the Art Institute of Chicago; and the Museum of the Twentieth Century, Vienna, Austria. In 1971 the Museum of Modem Art held a major retrospective exhibition of his sculptures. 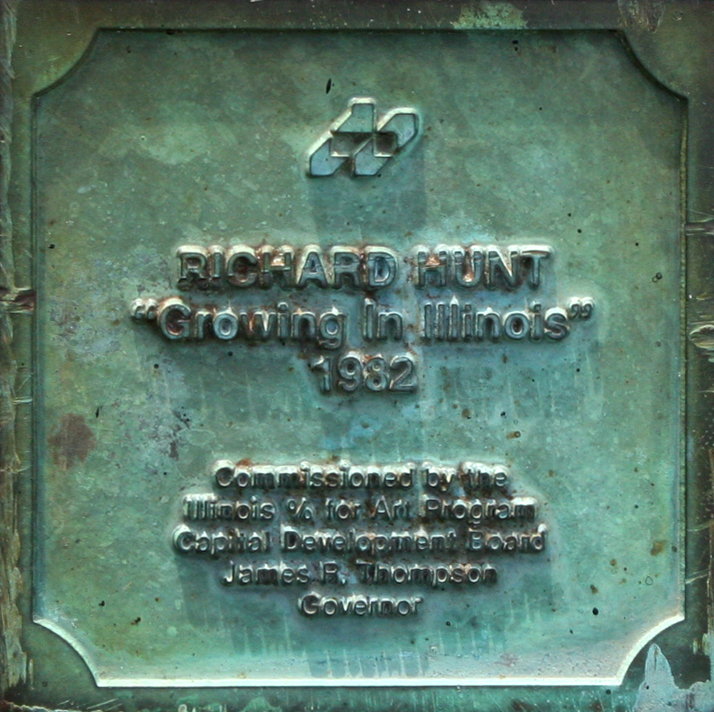 Muriel Scheinman, “Growing in Illinois, 1982,” ExploreCU, accessed April 21, 2019, https://explorecu.org/items/show/30.